The East of Asheville Studio Tour (EAST) is an open house where local artists in the Black Mountain/Swannanoa area invite visitors to see where it is that some of our fantastic local art you hear so much about is created. Fine jewelry maker Robert Vengoechea who owns Visions of Creation, Will and Trish Byers of New Moon Pottery, and Southern Highland Craft Guild member Akira Satake are just a few of the artists who will be inviting visitors to their studios. EAST takes place in the Spring and Fall. This tour will be May 3 (10am to 6pm) and May 4 (12pm to 5pm). Visit the EAST website for a map and full list of participating artists. The North Carolina Glass exhibition at Blue Spiral 1 Gallery (just north of Biltmore Village) begins with an opening reception on May 1. The group exhibit, which runs through June 28, features the work of more than 20 artists. Pieces include sculpture, vessels, wall installations, furniture, goblets and even kaleidoscopes. 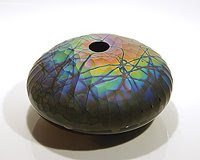 From the photos on the Blue Spiral 1 website, it looks to be an amazing exhibit if you enjoy glass works. Other exhibitions at Blue Spiral 1 during this timeframe are works by Sylvie Rosenthal, Scott Upton & Sang Roberson and an exhibition called Referencing the Earth, featuring glass, wood, clay and paintings by four artists. The gallery is open Monday-Saturday, from 10am to 6pm and Sundays from 12pm to 5pm. LEAF will celebrate the arts over a three day period, with musicians, dancers, handcrafts, healing arts, poetry, culinary arts, and even a kids village. The outdoor setting at Lake Eden is spectacular, with great views of the beautiful mountains as spring arrives. LEAF also takes place in the Fall, so if you miss it this time around, you can check it out October 17-19. This entry was posted in Uncategorized and tagged art, Asheville, festivals and special events by Inn on Mill Creek. Bookmark the permalink.